The aim of the Portsdown project is to enable an amateur radio operator with little or no knowledge of Digital ATV to construct the hardware elements, load and configure the software and use the system to send live Digital ATV signals across town on his existing aerials. 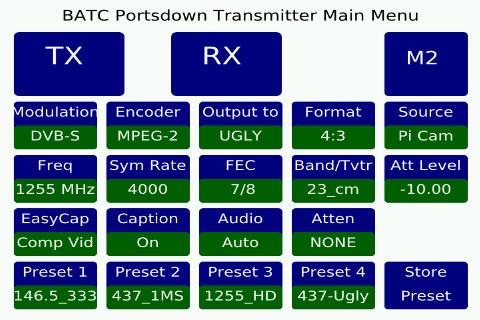 The Portsdown DATV transmitter project provides an easy way to “get on air” with Digital ATV at a relatively low cost covering all of the commonly used DATV modes enabling it to be used for cross town QSOs, accessing ATV repeaters and for working the DX using Reduced bandwidth (RB-TV) modes. The project, which was featured in the June 2017 issue of the RSGB's Radcom magazine, involves some basic construction and is based around a Raspberry Pi with a touchscreen and uses a LimeSDR Mini - before January 2019 the Portsdown used a custom filter modulator card and external local oscillator. At the heart of the The Portsdown Transmitter is a Raspberry Pi (RPi) computer running a BATC customised version of the F5OEO rpidatv software. The choice of the RPi is primarily due to the fact that it has an on-board MPEG-4 (H264) encoder and the versatile hardware interface (GPIO) capabilities. From January 2019 the custom BATC Filter Modulator board has been replaced by a LimeMiniSDR. This covers a wider frequency range and adds DVB-S2 capability but limits the maximum symbol rate to 1.5Ms depending up on transmission modes. A touch screen interface (available from Amazon) enables the system to be used as a standalone unit without further need to connect up keyboard and mouse. If the LCD is not available, the system can be controlled by using an external PC connected over a wired or wi-fi network (console mode). The output from the RPi is connected to a LimeSDR Mini (or the original Filter Modulator board) which modulates the RF carrier and produces the DVB-S DATV signal. 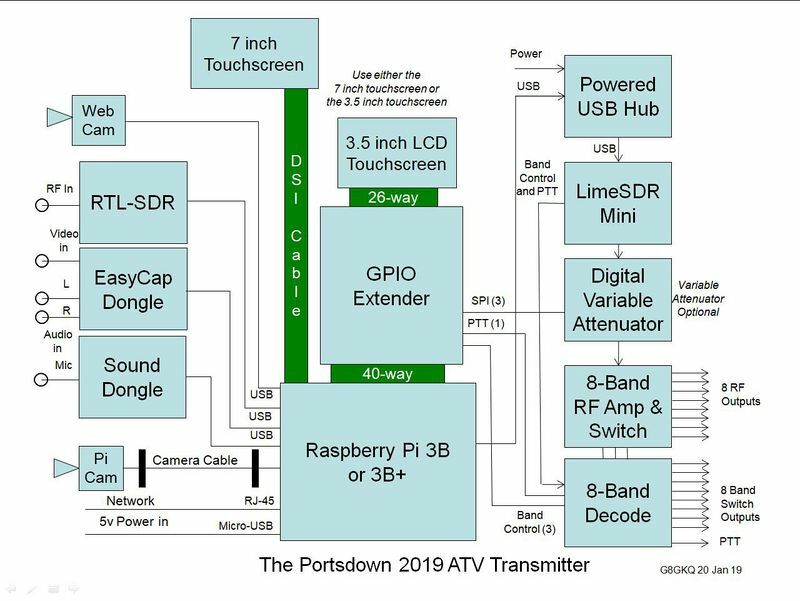 The Portsdown transmitter will take audio and video inputs from the RPi camera, an EasyCap USB dongle and a USB sound card / dongle - all these are readily available from ebay and Amazon. The great thing is you don't have to build any hardware to get started and send pictures across the shack!! Now you've read the system overview, take a look at the user guide - it contains a lot more information on what hardware is required and where to buy it and how to get and configure the software. Or if you want to print off an overview of the project, we've produced a File:Portsdown Brochure V3.pdf 2 page introductory brochure which also includes a spec sheet for the Portsdown transmitter. Finally TXfactor have produced a great video introducing and explaining Portsdown and ATV in action - take 15 minutes to watch it here. This page was last modified on 23 January 2019, at 09:30.